It's a quality that doesn't rank high in our competitive, consuming, instant-gratification culture. We want things, and we want them fast. Some families reminded me recently of the importance of patience in raising children with disabilities. The first was Pia Pearce, mother to Kevin Pearce, an American snowboarder expected to win gold at the 2010 Olympics until a crash nearly killed him, severely injuring his brain. Kevin was hospitalized and had to relearn everything—to swallow, walk and talk. He was unable to return to competition. It’s common for parents of children with traumatic brain injury to mourn the child they knew pre-injury. That stuck with me and I wondered how it could apply to my experience raising my son with a rare genetic condition. Judith’s work, which combines fibre and found objects like an umbrella, branch, bicycle wheels and plastic tubing, has been shown in museums around the globe. Ten years after her death, “Bound and Unbound” is a 60-piece exhibit at the Brooklyn Museum in New York until the end of March. Judith’s story made me think about how impatient we typically are—as families and professionals—when exposing children or adults with disabilities to activities or work. How often do we encourage a person to try something like art—on a daily basis, for two years, as Judith was—when the person doesn't show any affinity for it? Rarely. We're more likely to assume the person isn't capable and insist that they move on. I think Judith's story is exceptional because without her unhurried time at Creative Growth, her talent would have remained hidden. I think the key word is respect. Because Joyce respected her sister, she continued to support her participation in the art program even when Judith didn’t appear to be making gains. When you respect someone, you give them time. You give them latitude. You believe they have worth. You value them as they are. I saw the benefits of patience in my own life recently. My son has been working at two high-school work placements. He has significant disabilities and a lot of growing and maturing to do. So this has not been without bumps. I reached out by email to the owner of one of the businesses to ask how things were going. In his response, the owner began by describing our son as “an awesome individual.” He went on to say that they had seen “slow but real improvements” in our son's work, behaviour, focus and attention. He addressed one of our son's challenges and his need to improve. He finished off by saying that our son was an asset to the team. I read this message to my husband and we teared up. We agreed that we had never had a message like this about our son before. Usually the feedback we receive focuses on the negative. And that invariably leads us to question our own weaknesses as parents. What I took from this business owner's message was that my son was being given time to develop and improve at his work. They were being extraordinarily patient with him. Despite his disabilities, they saw his value. This made my husband and I feel more hopeful about our son and more motivated to support him and stay positive about his experiences. It made me wonder why we don't talk more about the benefits of patience in parenting kids with disabilities and the intrinsic self-worth of children (distinct from ability). Is it possible that we're missing something in our focus on goals and outcomes and hurrying people along in their development? Are we too quick to judge people incapable? And resign them to the margins? Maybe we could all benefit from more patience. 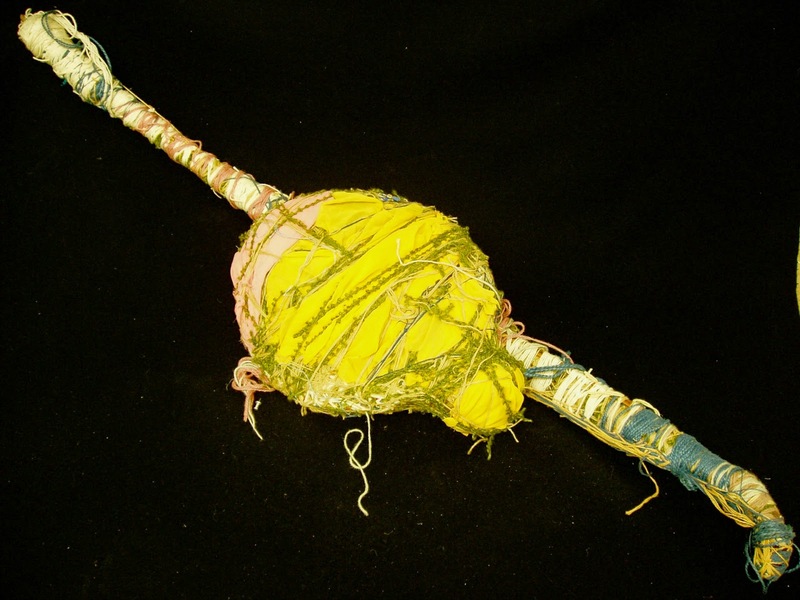 The photo is of an unnamed sculpture from Judith Scott's Bound and Unbound exhibit at the Brooklyn Museum. Please click on it to see the full image. The headline above is a quote from Shakespeare's Othello. Look for a more in-depth interview with Joyce Scott in the winter issue of BLOOM next month. What a pleasure to see this interesting, layered work! Thank you, thank you, thank you. Such a poignant and important message for me personally, Louise! As a mom with a son with disabilities and a daughter who aspires to be an artist I will go to Brooklyn to see the work of this amazing women. Thank you for bring attention to the importance of patience which is often over looked. I know from my own experience as a parent it is true. Toby -- please let us know if you're able to see the exhibit and what it's like! Thanks for posting!